How can we care more? How can we all do more for the social issues we care about instead of waiting for the government and institutions to solve them for us? 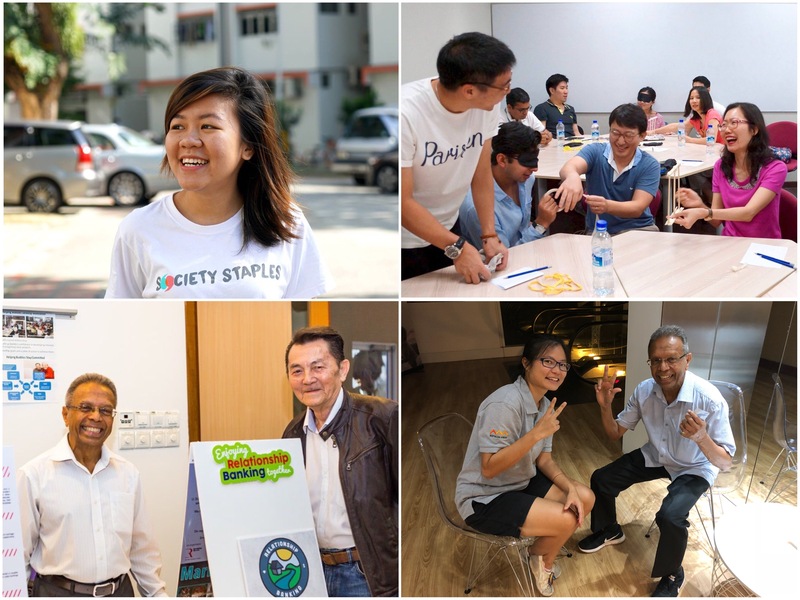 At A Good Space, we believe in the idea of active citizenry – that each of us has power within to create initiatives that make a difference and create a better Singapore. But with so many different social issues and challenges out there, it can be easy to get overwhelmed – where and how can we start? That’s why we are organising A Good Day, a unique full-day event filled with innovative activities to help you learn more about Singapore’s most pressing social issues. The activities are taking place across 4 tracks, each set in beautiful locations and with unique activities per track. From mental wellness to migrant workers, a wide and diverse range of social issues are covered. And the best part? 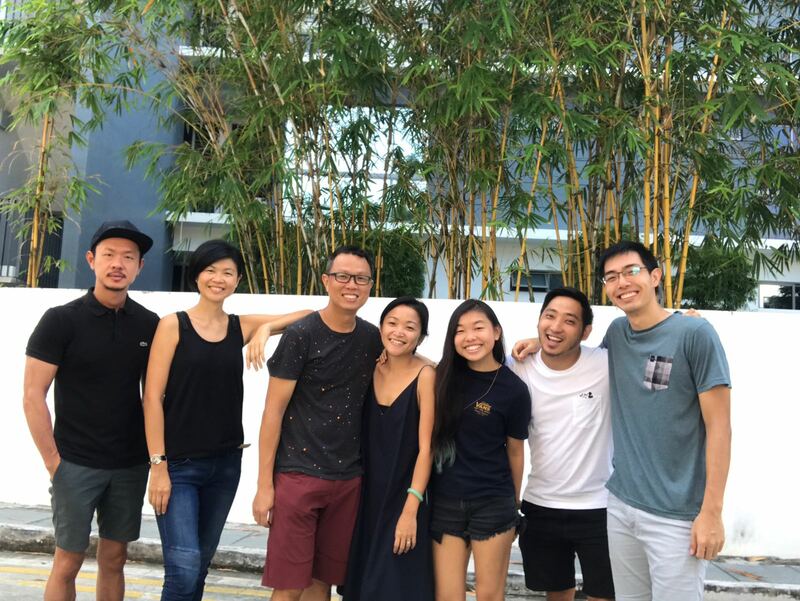 We are gathering 17 of Singapore’s mostly quiet yet inspiring changemakers. Scroll down to read some of their stories and learn more about the activities they will be organising for A Good Day. 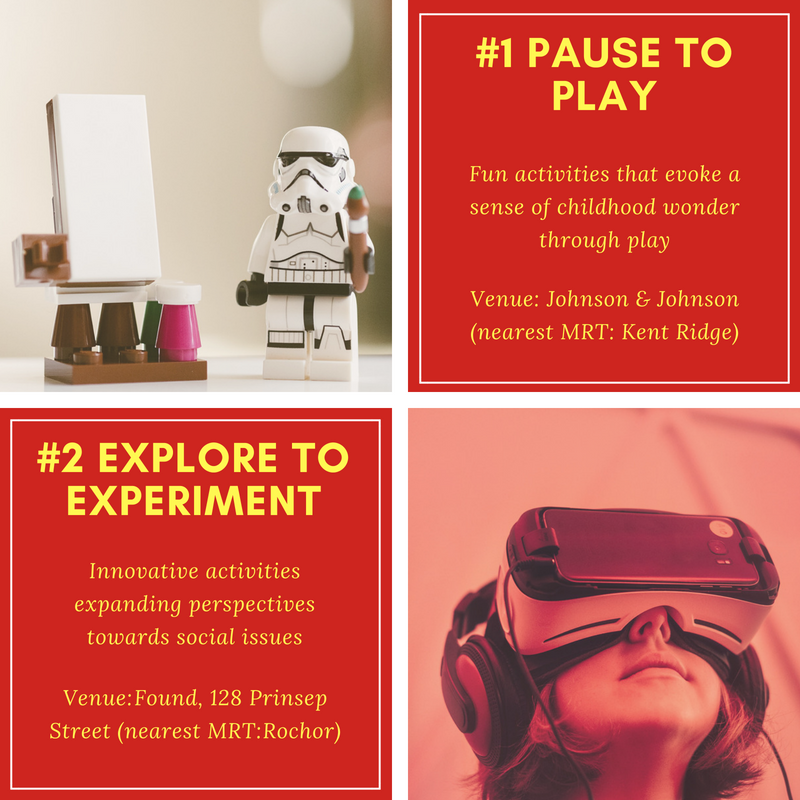 And do come down to support them and participate in their innovative activities at A Good Day on 23rd June 2018 (Saturday)! Tell us more about your story! Bernice: I was never passionate about interacting with the disabled community prior to joining Society Staples. Working here has taught me more about how society limits them — from a lack of infrastructure to how friendships between Singaporeans and the disabled are rare. Dexter: As a senior, I enjoy speaking to youths and finding out what is current as this helps me to stay relevant in an ever-changing society. I realized there was a great lack of inter-generational conversations between youths and seniors so I decided to start a group to facilitate that. What makes your activity innovative? Instead of the usual workshops or talks, we are using a card game! Through questions listed on the cards, we encourage conversations amongst participants, allowing them to step into the world of the disabled and their lives. What does it truly feel like to be disabled and excluded from society? Those are the questions we hope to raise. What changes or impacts would you like to see with your activity? We would like to inspire participants to be more proactive in starting conversations with the disabled and not being afraid to interact with persons with disabilities. Vivi: Since young, I have always believed in spending time on what is important to me. In our society, we often live with a definition of success that is given to us by society, and not created by ourselves. I believe that once we are able to define what is important to us, we will be able to achieve success. Mei Chuen: It has always been my dream to share books that have impacted me at the lowest points of my life. A book that lifted me out of depression and gave me a renewed purpose in life was Viktor Frankl’s Man’s Search for Meaning. Since then, I have been on a mission to share the wisdom I received with others who need a fresh renewal in life, just like I did during those dark times. In the busy-ness of our lives, it is vital to revisit the meaning of our lives — why do the things we do? 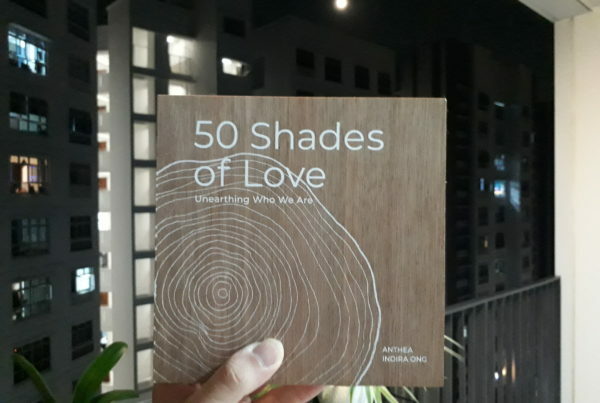 Through a book discussion, participants will be asked questions to discover what makes their heart sing… and we will ask them to express their thoughts by moulding them into clay! Clay can be a very innovative and creative medium of expression and we hope it can be used to share their inner-most thoughts. We hope for our participants to leave the discussion thinking and reflecting on what they truly hold dear, as well as their values and direction in life. We hope they can apply these insights and have a stronger will to live a meaningful life for others and themselves. May apathy will be a thing of the past! Shobana: When I first volunteered at a dormitory for migrant workers, they were shocked when we spoke to them in Tamil. For many of them, it was their first time interacting with a Singaporean in a friendly manner. Many of them are far from their homes, coming here to work in difficult jobs to support their families. Like us, they have many stories to share and as a Singaporean, I wanted to create a platform to initiate conversations between Singaporeans and our migrants brothers. We dream of creating an inclusive Singapore where our migrant brothers are seen as people first. Amin: I’ve always had a passion for working with children, especially those with special needs or come from disadvantaged backgrounds. Many of them have difficult childhoods and lack confidence and self-esteem. Through innovative art, design and animation workshops, I wanted to help them develop their creativity and imaginative skills. Through creating beautiful pieces of digital art, I can see them becoming more creative and confident. That makes me very happy. Opportunities to interact and create meaningful friendships with our migrants brothers are largely unheard of. Participants will be guided in creating beautiful artwork using Microsoft PowerPoint (yes it can be done!) around the theme of Home and what it means to them. Afterwards, there will be a discussion with our migrant brothers (who’ve created their artwork beforehand) on what home means. Participants will get to hear stories from our migrant brothers on leaving and finding home in Singapore, while sharing their stories too. Through this activity and the interactions within, we hope to inspire more Singaporeans to stand in the shoes of our migrant brothers and view them as friends, rather than second-class citizens. Join us at A Good Day! Put this on your calendar. It’s an experience you won’t soon forget. Eleanor: Over the years, I’ve been very active in advocating for inter-generational bonding between seniors and youths, and also changing the narrative that seniors are dependent and weak. I created Ageless Online, an online magazine featuring inspiring stories of active seniors and information to help them live healthier and happier. “How do I speak to a Senior?” was a question a young man had when I was speaking at a University. I hope to create more opportunities for youths to do that. This is an iteration from Feast with Strangers, first started by Oxford historian Theodore Zeldin, who invited strangers into his home for his 60th birthday for an evening of meaningful conversation, and has since been held all around the world. Through a menu of curated questions that seek to encourage a sharing of life wisdom, experiences and stories, come talk to seniors (in their late 70s, 80s and even 90s)! If you’ve never had a chance to do this, then come join us! After all, we will grow old one day! I hope to inspire a society where everyone has a senior friend, with whom they can learn, grow and share stories with. My dream is for all of us to be able to live and age in an inclusive environment. Wan: The Singaporean narrative of diversity is often centered on our differences. What does diversity mean to you? To me, diversity is understanding our differences but embracing our similarities. We can only perform as a nation if we chose to celebrate diversity and communicate before we conclude. Racial and religious harmony is often initiated by top-down policies or procedures. Led by youths, our event is youth-centered, ground-up and attracts the multi-religious, multi-ethnic because diversity knows no bounds. Come and see things from your perspective. The stories from real people to the people. As the most religiously diverse nation on the planet, we hope to inspire people to initiate conversations of their own. We hope to create change — to go from what was once a taboo issue to a nation that exercises empathy and eventually becomes a role model for the world to follow. Wanyi: As a community worker, it was my job to step in and out of the lives of broken families. I questioned my decision and impact I made from working in the social sciences sector. Was I able to make a difference? What is poverty? Having these thoughts allowed me to take a step back to understand poverty. The opportunities I had were due to luck and that motivated me to change the way I channel my resources to help others effectively. Rather than doing what feel right, I should use careful reasoning and evidence to work out how I can create the most impact with my giving. Have you ever heard of “A Giving Game”? Well, it’s my first time too! We all know of someone that gives, it might be a small or huge donation but what if you were empowered to more than just a charity pledge? This event will challenge our inner giving philosophy and help us to have a greater understanding of the impact of our giving. With this understanding, you’ll also get to decide between a few charities to donate real money to at the end of the game! 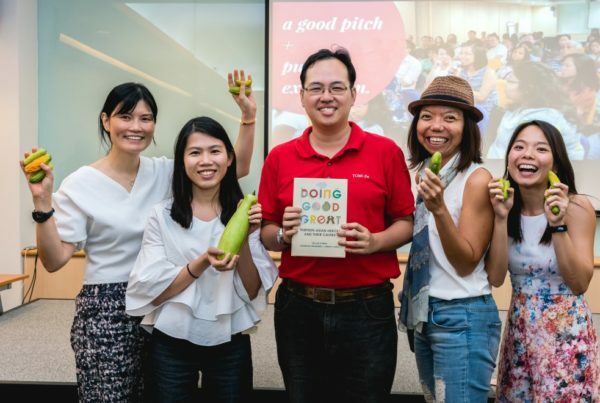 We anticipate that our participants would huddle together to examine the impact of their giving and with this, we hope to inspire them to consider how they can make more effective donations and make a greater difference in the world with their giving. Lewis: I have been working on projects to facilitate understanding across different segments of society. In particular, a project related to race and racism ignited a curiosity within me. There was a Chinese lady who shared that she had believed racial harmony was present in Singapore. However, she realized things were more complicated when she married an Indian man and had children. Coming from a majority race, that got me thinking that we might not be able to understand how minorities feel because of our privilege. Participants will get to explore the ideas of what it means to be in the majority or minority! Through experiential and discussion activities, we will evaluate multiple perspectives and dig deep to understand what lies behind them. Our hope is for participants to cultivate the ability to think of different perspectives whenever they meet with a complex issue in the future. We hope to inspire them to be a catalyst to encourage their loved ones to start thinking about different facets of the social issues we face, rather than taking the side of the majority for convenience’s sake. Sullivan: I love playing board games and I’d like to see how it can be used to add value to the lives of others. I believe in creating games that challenge the beliefs of players and allow them to consider different perspectives towards the issues in society. I think games can be a great tool in helping to cultivate more empathy and understanding in our society. We will be playing a board game based on The Quiet Year, a tabletop game about mapmaking and world building which was voted Most Innovative Game of 2013. You play as a member of a community that has just experienced an environmental apocalypse of some kind. Together with other players, you work as a community to make decisions and take action in the ‘year’ that follows. Along the way, you’ll learn how different perspectives and conflicts arise in decisions about the environment and explore how to resolve them. In this game, players learn to work and solve problems taking into account the concerns of other players in their ‘community’. 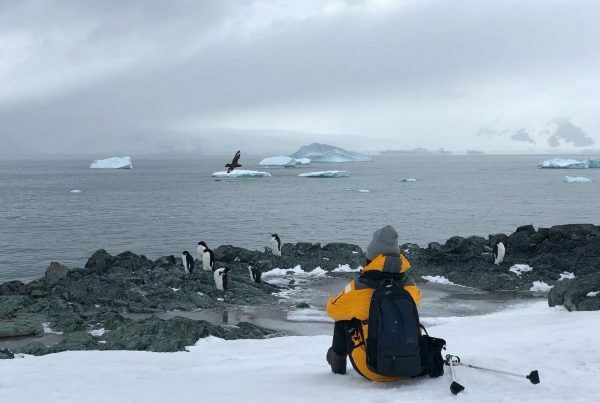 I hope this game inspires people to take further steps to learn more about climate change and how they can do their part. I also hope they can adopt a similar approach when they are approaching different social issues; to consider multiple perspectives before making a decision on what to do. Get a ticket for A Good Day at just $39! All funds raised will go towards supporting the National Volunteer and Philanthropy Centre (NVPC). Save a Ticket for Me! Sherry and Lynn: We were both deeply affected by the tragic case last year of Annie Ee, who had intellectual disabilities and was fatally abused by her flatmates. While there was widespread outrage at what happened, we felt that there was a lack of self-reflection and open conversation about the Bystander Effect. So many people were in contact with Annie but yet they did not act, choosing to remain as bystanders. We feel that each one of us can have a role to prevent such cases from happening in the future. Through this #CraftForGood activity, we will encourage people to slow down, craft and engage in meaningful conversations about the topic of bullying. The end product will be a reminder to oneself to be mindful of one’s thoughts and actions, and how one can contribute to a kinder and safer society. We hope to inspire a kinder society where reflective conversations and thoughtful action on social issues happen. We also hope for more people to become aware of invisible communities, such as adults and seniors with multiple disabilities staying in welfare homes, refugees in our neighboring countries, etc. and be actively involved in reaching out to them. Carol: After observing many seniors feeling lost in life and socially isolated in their golden years, I assisted my father in setting up a University for seniors called U 3rd Age (University of the Third Age). Through activities and events, we encourage seniors to engage in social networking and lifelong learning, promoting active aging and reducing cases of dementia and depression in the process. 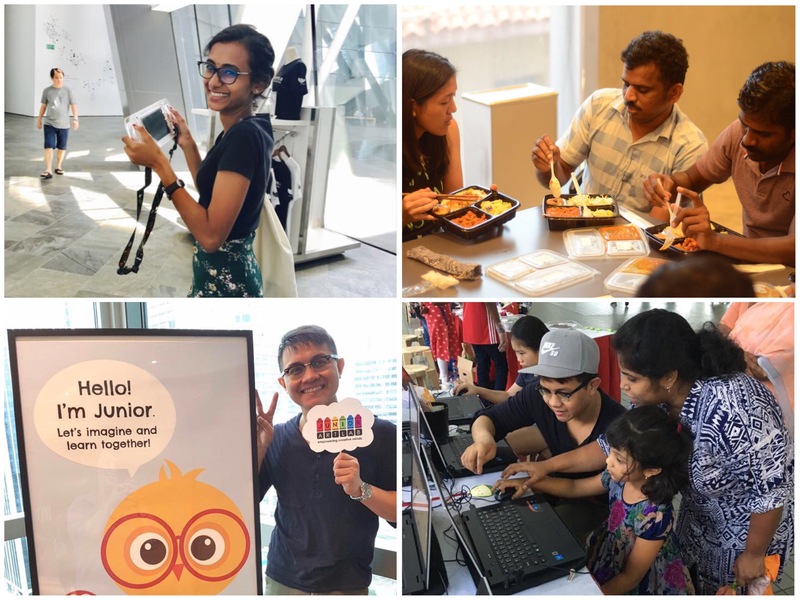 Nurul: I’m working for a local non-profit Silver Ribbon (Singapore), which aims to create a positive attitude towards mental health among Singaporeans. Our mission is to combat mental health stigma, encourage early treatment and facilitate integration of people with mental illness within the society through innovative means of promoting mental health literacy. The game is a modified, life-sized version of our popularly known, ‘Snake and Ladders’ board game. It is specially designed to encourage positive mental health and to encourage inter-generational bonding among participants through sharing moments of gratitude, experiences and ideas related to happiness. 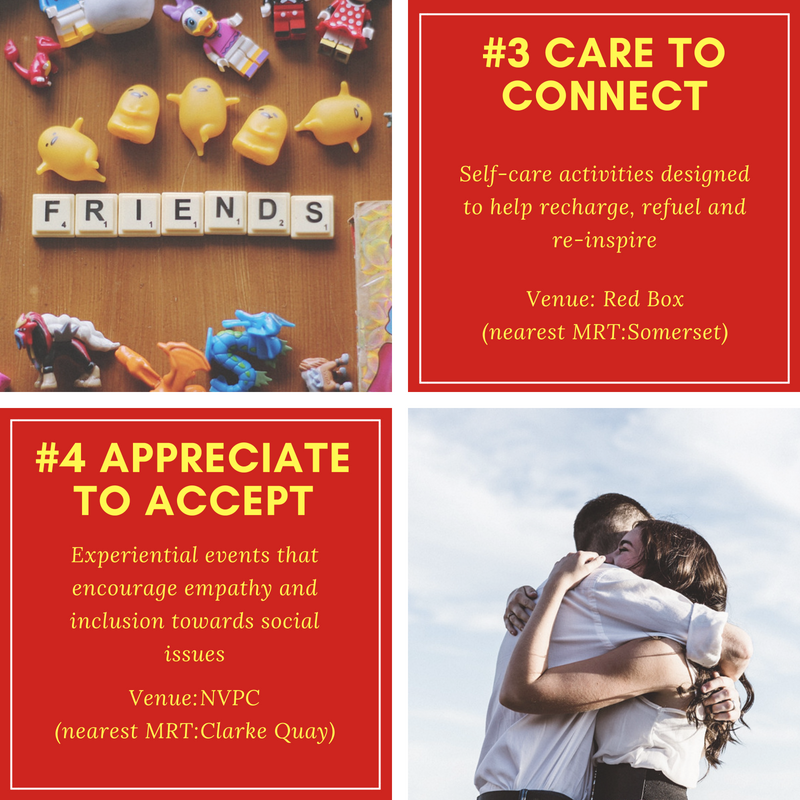 Each secret task on the board aims to help participants gain a deeper understanding of mental wellness in Singapore, including the various avenues for help, action steps they can take to help themselves or a friend in need. A quote we would like to share from Margaret Mead, “ Connections between generations are essential for the mental health and stability of a nation”. From this, we also hope that the younger generation will be able to understand and accept that aging is a journey for everyone and bridging the ‘generation gap’ would help reduce the occurrence of depression among older adults. Aaron: In a competitive meritocracy like Singapore, we are often racing for the top — better grades, more money, prestigious job, etc and living in our bubbles of privilege, it can be very easy for us to overlook people in vulnerable communities — such as the deaf, blind and poor. I have always been passionate about helping more Singaporeans cultivate empathy towards these sometimes ‘invisible’ communities through simulated experiences. 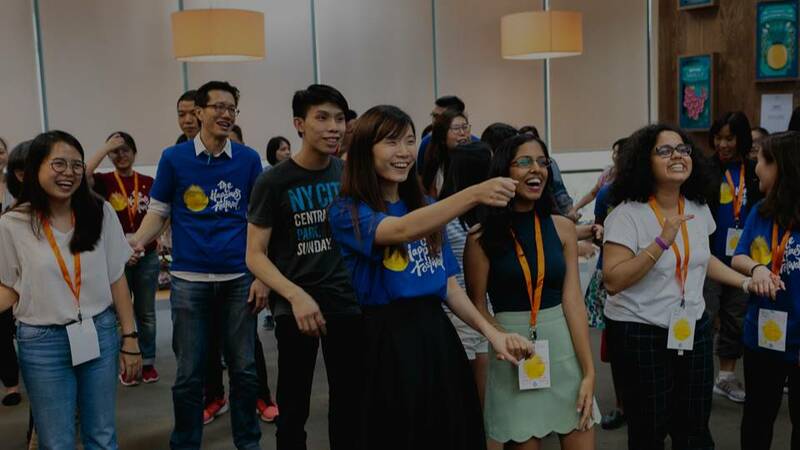 Participants will go through a simulated experience to understand what it’s like to live in poverty in Singapore. In the time we have, they will experience some of the choices people living in the bottom 10% have to make, in a meaningful and relatable way. With a better understanding of poverty through the simulation, we are also encouraging participants to join us in a collection drive for second-hand books and clothes, which we will then donate to families in rental flats, whom need it but cannot afford it. 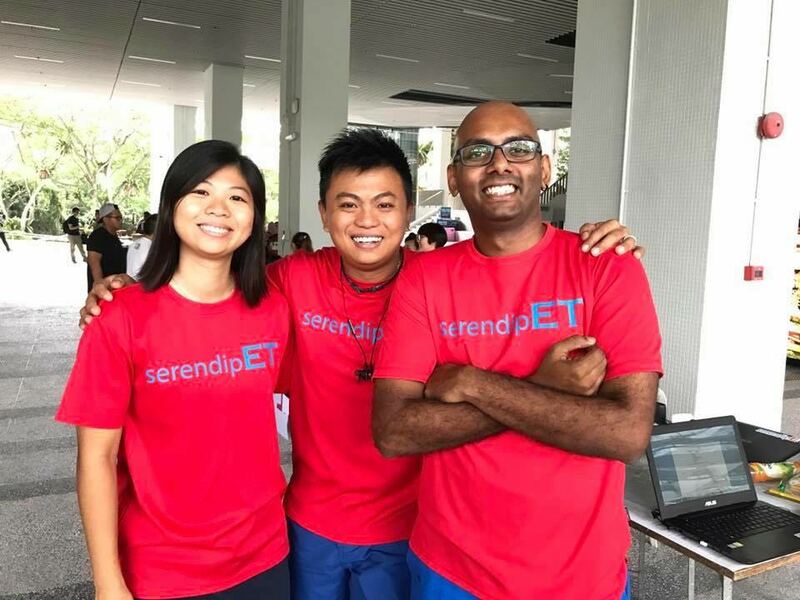 Last but not least, a shoutout for our partners Peizhi, Yuan Long and Tines from the social enterprise SerendipET, who have so kindly lent their event management expertise in helping all of the above changemakers put their activities together! And also to our partners over at Imagine+, Fiona, Ginger, Lennard and Joie, who have generously offered to support all event logistics and management in helping to bring A Good Day to life! Thank you for reading to the end! Feeling excited after this article and wondering how you can participate in A Good Day? Go to our registration page for A Good Day at: agoodday2018.peatix.com and select ‘Get Tickets’. It’ll take you to a short registration form where we’ll get some of your details and you’ll choose a track to attend at A Good Day. 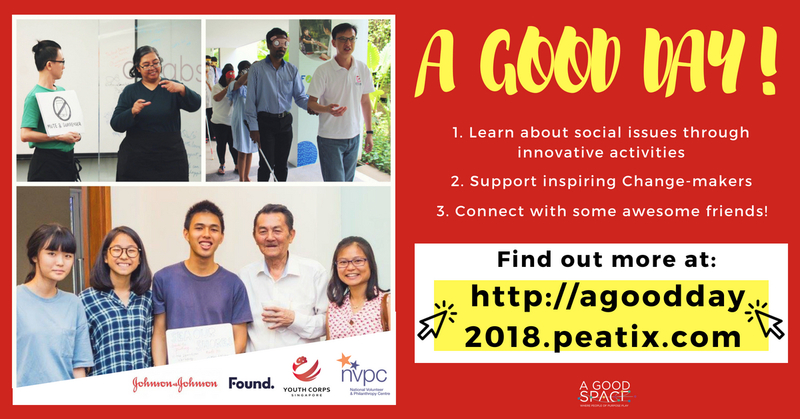 After you’ve completed the form, go to our fundraising page on Giving.sg at: www.giving.sg/nvpc/agoodday2018 to donate $39. All funds raised will go towards supporting the National Volunteer and Philanthropy Centre (NVPC). And voila, your ticket is confirmed for A Good Day!